A recent estimate suggests that there are 120 million pastoralists and agropastoralists in the world. Some 50 million of these live in sub-Saharan Africa, where pastoralism is a widely used practice in an area extending from Senegal to Somalia. There are also many African pastoral communities within the band stretching from the Horn of Africa to Namibia. A considerable amount of pastoralism also exists in the arid areas of Central and Southern Asia 1 and of the Tibetan plateau, in Europe, and in Andean plateaus in Latin America. Pastoralism was for many years opposed by central governments, which viewed these mobile societies as sources of instability. But pastoralism is now acknowledged as a sustainable system particularly adapted to arid and mountainous land. It is once again in the spotlight, especially along with the N’Djamena and Nouakchott declarations (2013); the launch of new large-scale programs dedicated to it in the Sahel; and, most recently, in the 2016 report of the High Level Panel of Experts of Food Security and Nutrition 2, in which pastoral systems are subject to description and specific recommendations. With this as a backdrop, how can we assess pastoralism, and how can we support it? 1 Pastoralism is the main economic activity of the people of Mongolia and the ex-Soviet republics of Central Asia, as well as in huge regions of China (Inner Mongolia) and Russia (Evenki and Buryat peoples). 2 HLPE CSA 2016 Report: Sustainable agricultural development for food security and nutrition: what roles for livestock? Pastoral and agropastoral livestock rearing (or pastoralism) is a production system based on extensive livestock rearing that makes optimum use of rangeland for the most part. The communities who carry it out are often on the fringes of society, and it is associated with a lifestyle based on special relationships among humans, animals, and nature. Pastoralism is the main livelihood as well as the source of food, income, and jobs in many arid and mountainous areas. This lifestyle has enabled pastoral communities to manage resources sustainably, independently, and flexibly. In many regions (West Africa, the Andes, and the Mongolian plateaus), it is more productive than sedentary livestock rearing and is the source of most animal products. Some pastoralists, called “agropastoralists,” combine livestock rearing with production of cereals and fodder (whereas farmers who have introduced livestock raising into their crop- farming activities are described as carrying out “mixed farming” and referred to in French as agroéleveurs). In many regions, pastoralism relies chiefly on natural grassland and on recovering crop residue. Its sustainability ensues from traditional skills based on three pillars: the choice and combination of different herbivore species adapted to the environment (cattle, zebus, camels, dromedaries, sheep, goats, yaks, reindeer, alpacas, llamas, horses, and donkeys); the use of diverse natural grassland (mainly natural rangelands that provide herbaceous plants, trees, and bushes), thanks to mobility; and above all the social capital of mobility, which enables pastoral groups to maintain and develop alliances with sedentary groups and the operators of markets of the many places traveled through. Herd movements are governed according to whether or not there is grassland and water access, but are also determined by other factors (markets, social networks, security conditions, and presence of brush fires or predators). Pastoralism strongly helps improve soil fertility thanks to transfers of organic matter between grassland and cultivated land. Further, it makes the best possible use of the resources available in the different seasons, thanks to the ecological knowledge of the environment that the livestock keepers have accumulated over the years. Pastoralism is a sustainable and autonomous system based on a low level of use of inputs. As such, it could be labeled as an agroecological activity; however, this is called into questioned by many, who still perceive pastoralism as a factor that degrades natural resources. It is mobility that gives the pastoral system its resilience. During droughts, it is mostly mobility that enables livestock keepers to limit their losses, as they can move their herds to strategic fallback areas (wetlands, protected areas, Sudanese rangelands, etc.) and at the same time find better conditions for cereal-cattle exchanges. 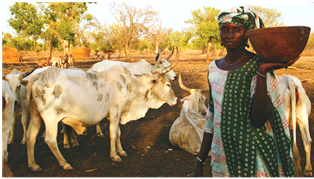 Pastoralism benefits not only the pastoral communities, but also all those who utilize the range of pastoral products. Whether processed or not, meat, milk, fibers, and hides wind up in the markets of urban centers. Manure, as well as work and transport by animal power, are used in farming areas. Pastoralism also provides essential services for the conservation of biodiversity and the preservation of ecosystems. It represents a significant primary-sector activity in many countries of Africa (Sahel), Asia (Mongolian steppes), and Latin America (Andes). In Africa it represents more than one third of agricultural GDP of the Sahel countries (Mali, Burkina Faso, Niger, Mauritania, and Chad). The OECD considers that, if we also take into account the contribution of livestock rearing to agriculture (manure, animal power, etc. ), its share would reach 50% of the primary sector’s GDP. 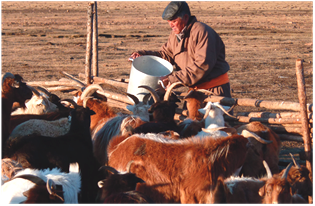 In many countries of Central Asia, such as Kazakhstan, Kyrgyzstan, and Mongolia, pastoralism is undergoing a phase of expansion due to the decollectivization of the sector and represents more than half of agricultural GDP. For all that, livestock rearing is a sector that benefits from little public aid. In West Africa, only 10% of expenditures in the agricultural sector is dedicated to livestock rearing, despite the commitment made by the heads of state of the African Union to devote 30% to it. Besides the amounts allocated, targeting of support is also crucial so that the funds help the pastoral and agropastoral systems first and foremost. Yet, in several countries we can see a tendency for policies in recent years to instead give priority support to so-called modern livestock-rearing systems that are more intensive and judged—in theory—to be more competitive. Such systems include introduction of European or American breeds, fodder production, artificial insemination, stabling, ranching, etc.). Pastoral societies often insist on their distinctive characteristics and sometimes wish to be differentiated from other family farms by using the term “pastoral communities.” For them, pastoralism is more than just producing livestock: it is also a lifestyle, a culture, and a full-fledged identity. This is why the pastoral organizations defend the right of pastoralists to conserve their lifestyle and their culture as well has their customary institutions. For many years, governments fought against the mobility that distinguishes these societies, and they implemented sedentarization and assimilation policies targeting them. Today, the right to mobility has made undeniable progress, thanks to the intense advocacy carried out by the livestock- keeper organizations. Despite this, we can see that pure, traditional pastor al systems are ev ol ving tow ards agropastoral systems, especially since the major droughts in the Sahel. These agropastoral systems are characterized by differentiated management of herds and semi-sedentarization of some family members. The distinction between farmers and livestock keepers is also tending to fade, especially in West Africa, as more and more livestock keepers develop crop and fodder production and farmers start up livestock rearing. The problems linked to the development of extensive livestock rearing are thus becoming not only an issue for the pastoral and agropastoral communities, but also for a broader swath of society. Despite the considerable progress made, mobility and support for extensive systems are being put to a disadvantage by several factors. These include demographic pressure, the effects of climate change, the choices to promote large-scale agriculture that spreads farming areas, and the phenomenon of privatization of resources. In many areas that were once made up of common pastoral resources, the privatization of commons has led to the pastoral populations being dispossessed of the resources to which they previously had access, or to marketing of harvest residues and of access to water, which represents an obstacle to their activities. In cases of very strong land pressure and when agricultural development is conducted without prior planning, it is the grabbing of water resources and the blocking of corridors that prevent the livestock from accessing water and that thereby increase the frequency of conflicts between farmers and livestock keepers (or that simply lead eventually to certain pastoral areas being given up). The pastoral systems are being weakened by the low level of public investment in pastoral infrastructures, the non-securing of pastoral land, and more broadly the lack of holistic vision in the governance of pastoral territories (which helps secure mobility and access to pastoral resources). The pastoral and agropastoral systems are also facing growing competition on the markets. In West Africa, local production is in competition with other products. For example, local meat is increasingly being replaced by other low-priced sources of protein such as giblets and offal, chicken, or frozen fish imported from India, Brazil, Europe, or China. These are available at prices lower than those of Sahelian meat in the coastal countries (Benin and Nigeria). Local milk is still suffering from strong competition with imported milk, especially in the urban centers of coastal countries. Access to urban consumers remains difficult due to the low level of competitiveness of the price of local milk compared to imported milk and the lack of incentive for processing companies to procure milk locally (only 10 to 50% of the supply of West African dairy companies is made up of local milk). There has traditionally been interdependence and complementarity between coastal countries on the one hand and the Sahelian countries on the other, especially with regard to the livestock trade. However, this relationship is weakening, due to growing difficulties in moving livestock on foot, problems of taxation at borders, and the desire of coastal countries to develop their own livestock raising using a “modern” model). This may eventually weaken the regional West African power relationships. In Asia, the establishment of the market economy about 20 years ago pushed the transhumant livestock keepers of the Mongolian Gobi Desert to increase their head of goats 3 for cashmere production in order to obtain sufficient income(and practically their only source of revenue). The result has been strong imbalance between the breeds raised, and a significant overgrazing crisis that is seriously threatening the sustainability of local ecosystems. We can see a gap between the significance of this subsector in the local economy, environment, and societies on the one hand and the volume of public resources attributed to livestock raising on the other 4. This is indicative of both how decision- makers have underestimated the many issues related to pastoralism, and of a political and social marginalization of the livestock keepers. This phenomenon in Africa goes back to colonial times and can be explained, among other things, by a weak presence of pastoralists and their representatives in the places where decisions are made. This tendency has started to change, following the creation of pastoral parliamentary groups (PPGs) in Kenya, Uganda, and Ethiopia. For the last 10 years or so, these have acted as an excellent representative base for pastoralists in national political circles. After decades of marginalization and pastoralism po licie s th a t e n cou ra ge d pa sto ra lists to sedentarize, progress for pastoralists is underway in the countries of West Africa as well, in terms of legislation regarding land rights and mobility5. During the recent Farmers Forum held in Rome on January 15 and 16, 2016, and throughout the International Year of Family Agriculture, the pastoral organizations proposed action on several themes to support their development, taking into account the specificities of pastoralism. Recognition of mobility, including across borders, is an essential condition to maintaining sustainable pastoralism. The recognition of the rights of pastoralists to have access to and manage pastoral natural resources (land, grasslands, water) must take concrete shape in the policies and instruments for land and natural-resource management. The goal is to limit privatization of land and change how pastoral land is used. Indeed, this latter is especially vulnerable in many countries. In order to optimize the use of rangelands and to maintain their major contribution to the food security of West African countries, pastoralism also requires continued efforts in building key infrastructures (water sources, rural trails and pastoral corridors, etc.) that will help secure the mobility of herds. Such infrastructure projects are still too few compared to the needs. The construction of production units and the promotion of innovative technologies to produce fodder and process harvest residue are also turning out to be indispensable when it comes to supplementing animal feed and securing livestock in the event of crisis. As for any family farm, access to economic services remains a key issue, whether it be access to production inputs (veterinary services, animal nutrition, advisory services) or access to markets (local, national, regional, and international) for the products of animal origin stemming from these extensive services. Finally, pastoralism, which is characterized by its mobility and its mostly regional nature, needs suitable cross-border services to be set up. (These include animal health, rest zones for the livestock, and market infrastructures). For the local value chains of livestock products to be able to develop, it is also necessary to take action at the trade policy level in order to limit low-cost imports that enter into direct competition with local products. At the same time, it is important to develop policies that give incentive to processing units that lay in supplies locally. ICT can help the pastoral sector evolve towards a more efficient model, for example through mobile monetary transaction systems or satellite early- warning systems that give information on the state of available biomass or the presence of brush fires. However, many obstacles must still be removed before the needs of pastoral populations are taken into account better. The global pastoral organizations are asking for the development of basic services (human and animal health, social protection, education, drinking water and energy, and access to credit and training) that are adapted to pastoral populations. At the same time, they see to it that pastoral communities’ needs (mobile services, among others) are taken into account, in particular those of women and children. These same organizations are asking that existing pastoral platforms be strengthened (such as WAMIP, the World Alliance of Mobile Indigenous People), to facilitate the development of policies with governments and regional institutions 6. 3 To the detriment of sheep, cattle, horses, and camels. 4 In Niger, Mali, Burkina Faso, and Senegal, the public expenditures allocated to livestock rearing over the 2002-2011 period represent only 4 to 8% of expenditures allocated to the agricultural sector. 5 Over the past 10 years, Mauritania, Mali, Niger, and Burkina Faso have adopted a law to secure the role of pastoralism. In Chad and Senegal, pastoral legislation is in the process of being developed.